1. Let's start with my GIVEAWAY of the week. It's getting darker in the mornings so all you morning runners need to stay safe and what better way than with Glimmer Gear. I am giving away an LED light up arm band! Enter to win here. Ends 9/7. 2. My good Blend Jeremy at Confessions of an Amateur Athlete is giving away a few of his favorite things including a Bib Rave shirt, PocketFuel and Cocogo! Enter to win here. Ends 9/14. 3. My friend Erica at Erica Finds has 2 GIVEAWAYS for you this week. The first is for Brieftons InstantVeg Spiralizer to make all those cool zoodle (zucchini noodles) you see everywhere. Enter to win here. Ends 9/11. 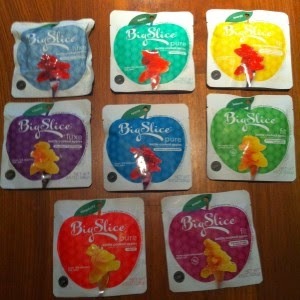 She is also giving away Big Slice Apples! They sound YUM! Enter to win here. Ends 9/9. 4. My sweet friend Carlee at CMCDot (Be the Change) is giving away a pair of Gladsoles, the barefoot running sandal. Say what?! You have to go check out her review. Enter to win here. Ends 9/4. 5. My always fun friend Ericka at Chronicles of a SAHM is giving away a set of 3 signed books for your reading pleasure. 6. Jacqueline at Nerd Family is giving away a Vitex Gel Memory Foam pillow. Umm yes please! 7. Raechel at Psyched2Run is giving away an Endorphin Warrior Training bracelet. Enter to win here. Ends 9/12. 8. Debbie at Healthy Running Mom is giving away a pair of my favorites - Crazy Compression socks! You MUST wear these socks after every long run! 9. Andi at Lunch It Punch It is giving away a Solvetta Flatbox Lunchbox (say that 10 times fast) filled with snacks. 10. Cassie over at Run with my Girl and a fellow MRTT runner is giving away an ivivva backpack on her Facebook page. 11. Kaella at Kaella on the Run is giving away a free month subscription to FitFusion. It's a digital platform that fuses together a variety of premium fitness videos. Enter to win here. Ends 9/5. 12. Julianne at Healthy Lifestyle Choices with Julianne is hosting a GIVEAWAY on her Facebook page to celebrate 750 likes. Tons of stuff to win including Honey Stinger products and sunscreen bands. Enter to win here. Ends 9/6. 13. And finally, Annmarie at Fit Foodie Mama is giving away a bottle of Block Island Organics Baby Block SPF 30. There you have it. 13 Bloggers. 14 awesome GIVEAWAYS. Which ones will you enter? Come back here and tell me if you won. Nice work putting all these together SD Mom. Is shipping free? Hi! Thank you for the nice words. The shipping depends on each individual blogger and how their giveaway works. I don't ever charge shipping when I do a Giveaway. Have you seen that before? Thank you! I love giveaways!